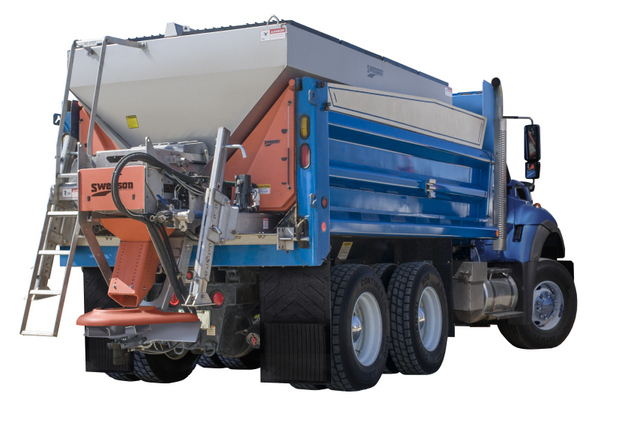 Swenson recently announced a new spreader for departments of transportation, municipalities and contractor fleets that combines state-of-the-art technology and high-quality American engineering. The EVolution Spreader is simple to operate, easy to maintain, and cuts material costs while delivering superior results. The EVolution allows for precise placement with its advanced in-cab controller that lets drivers select from one to three lanes of coverage and six spread pattern options, making it easy to place materials in exact locations and keep salt on the road and out of the soil and waterways. For optimal performance and cost savings, the EVolution is capable of producing a 70:30 granular to liquid pre-wet ratio, which is a ratio of 65 gallons per cubic yard of salt. The super-saturated mixture is optimal for melting ice fast to keep roads safe while dramatically reducing salt loss. This EVolution Spreader will be featured at the American Public Works Association PWX Event August 26-29 at the Kansas City Convention Center in the New Product showcase Booth 1841. For more info about Swenson, click this link.